New broadcast on All India Radio - "Research on Radio Waves from Jupiter"
Jupiter Observing Season 2010 Now Underway! My journey in the field of Radio astronomy as an amateur started with S.P.A.C.E (Science Popularization Association of Communicators and Educators) where we built a Radio JOVE kit as a part of my student project during my 3rd semester of engineering. I was assisted by Mr Akhil Chopra an engineer who helped me out at every step of the project. SPACE is a society registered under the Indian society registration act. It is a voluntary organization working towards science popularization. It is a team of dedicated and eminent astronomers, science communicators & educators. I joined them as a student volunteer and they encouraged me to work in the field of radio astronomy popularizing Radio JOVE. Therefore I applied for the winter school at the NCRA (National Centre for Radio Astrophysics) in my second year of the B.Tech (Bachelor of Technology) programme and got through. 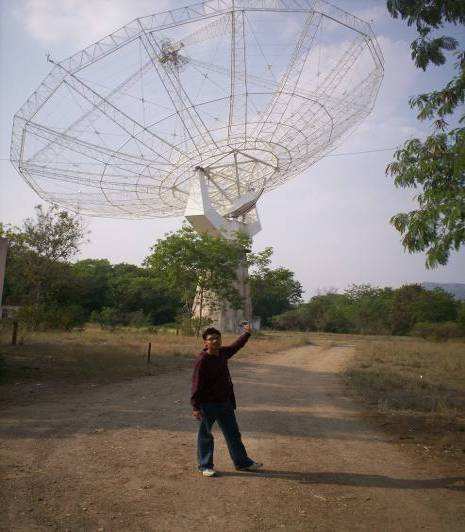 NCRA, a center of the school of natural sciences of the TIFR (Tata Institute of Fundamental Research), has set up a unique facility, the Giant Metrewave Radio Telescope (GMRT) for radio astronomical research at meter wavelengths. GMRT is a very versatile instrument for investigating a variety of radio astrophysical problems ranging from nearby Solar system to the edge of the observable Universe. We (a group of about 30 students) visited GMRT as part of our winter school program. A dish antenna at GMRT. There are 30 such antennas spread over a region of 30 kms. The Giant Metrewave Radio Telescope (GMRT) consists of 30 antennas, each of 45 meter diameter, spread over 30 km area, at Khodad, 90 km from Pune. It is the world’s largest radio telescope working at meter wavelengths. 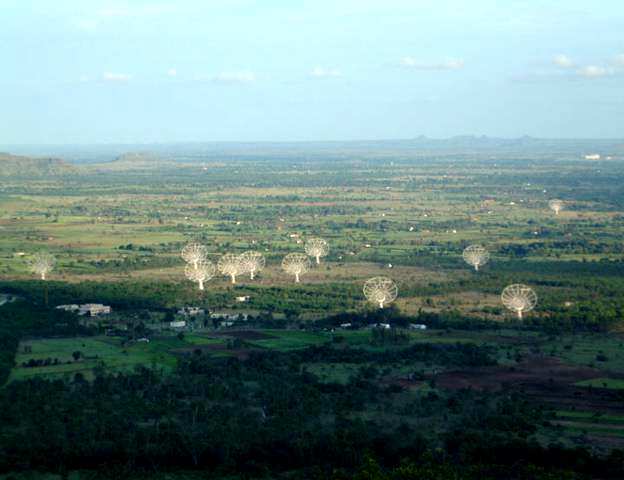 The site for GMRT, about 10 km east of the town of Narayangaon on the Pune-Nasik highway, was selected after an extensive search in many parts of India, considering several important criteria such as low man-made radio noise, availability of good communication, vicinity of industrial, educational and other infrastructure and a geographical latitude sufficiently north of the geomagnetic equator in order to have a reasonably quiet ionosphere and yet be able to observe a good part of the southern sky as well. We reached GMRT late at night where we had our dinner and then we moved to our guest house. At night the place is full of silent waves spreading all over with danger of some wild animals. We were taken to the controller room in the night where Prof. Bhal Chandra Joshi from NCRA was busy in monitoring a pulsar. The Control and Monitor System of a Radio Telescope is required to provide the necessary co-ordination between the various building blocks of the receiver system. It provides the human interface to persons like Telescope Observers, Scientists and maintenance personnel for operating all the antennas. It has to monitor all parts of the telescope system for correct operation. GMRT has many sub systems like the	frontend system, servo system, telemetry system, correlator system, analog backend systems and fibre optics system. During the night we were only able to see red colored lights blinking on top of some antennas from the terrace of GMRT. But still I was able to admire the large antennas using binoculars during the night. As it was getting late I decided to sleep and the next morning was a beautiful day with the sun shining high in the sky as if it was spreading its rays on the dish antennas. NCRA has built and operates the Giant Meterwave Radio Telescope (GMRT) which is the most powerful radio telescope operating at low frequencies. It is a national facility used by astronomers across the world, leading to significant discoveries. NCRA has also built and operates the Ooty Radio Telescope which is a large parabolic cylindrical telescope. The NCRA is a leading centre for research in a wide range of areas in astronomy and astrophysics. 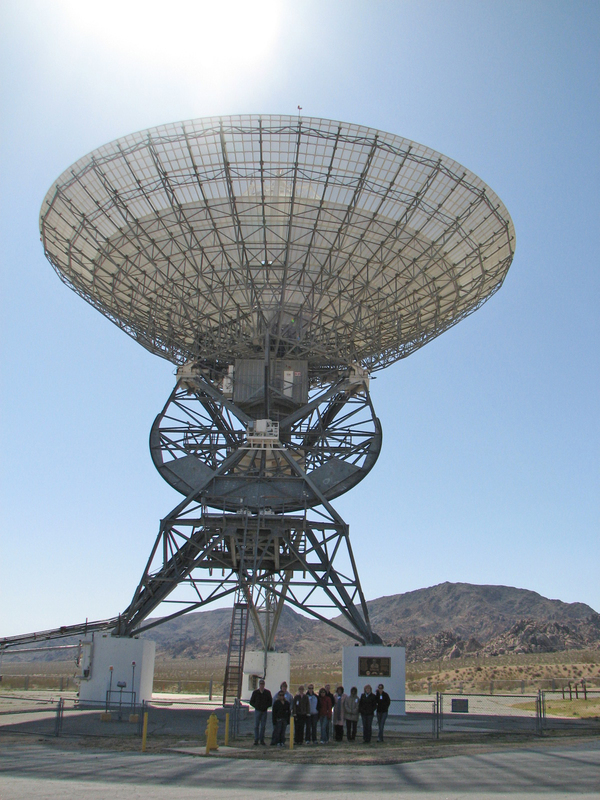 NCRA also offers exciting opportunities to work in technical aspects relevant to radio astronomy such as analog and digital electronics, signal processing, antenna design, communication and software development. NCRA offers many students research fellowship programs. Interested students can participate in winter and summer research programs. Currently Radio JOVE is not used at NCRA. I discussed my experiments and Radio JOVE set up with professors over there and I asked them to introduce Radio JOVE as a topic during winter school program. Prof Bhal Chandra Joshi at NCRA is very encouraging and he motivated me to carry forward with Radio JOVE activities. 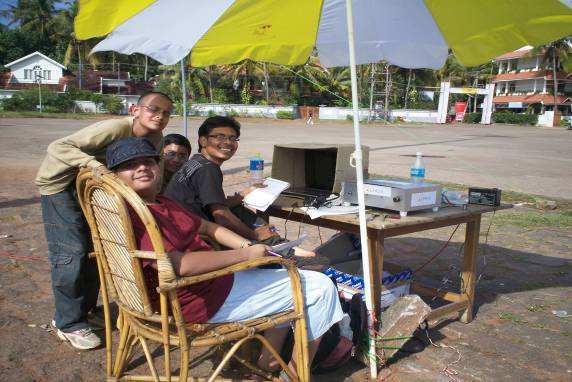 It was due to the motivation provided by SPACE, Prof Bhal Chandra Josh, Prof Joydeep Bagchi, Victor Herrero, and Divyadarshan Purohit that I was encouraged to travel down 2995 kms from my house to Varkala, Kerala to carry out amateur radio astronomy during the annular eclipse . I discussed my experience with Radio JOVE with other students in the winter school and asked them to participate in the Radio JOVE educational program. My visit to GMRT motivated and inspired me to study the vastness of Radio astronomy and popularize Radio JOVE, at the amateur level so that students can actively participate in Radio JOVE activities. 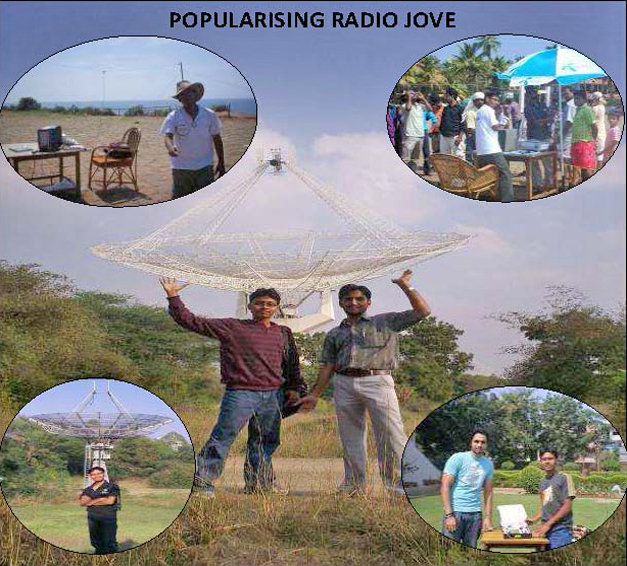 Radio JOVE set up at Varkala Kerala where SPACE popularized amateur Radio Astronomy activities. In fact I realized the meaning of radio astronomy by visiting NCRA's GMRT. All India Radio (A.I.R.) is the official radio service of the Government of India. You all will be pleased to know that on behalf of the President of India, AIR headquarters based at New Delhi signed a contract with me for six months to telecast/broadcast my talk show on "Research on Radio Waves from Jupiter" (Brihaspati se prapt radio tarango ka adhyayan) in the Indian National Language, Hindi. This will be broadcast from all AIR stations over all of India as well as reach overseas with the help of DTH (direct-to-home broadcasting). To speak on AIR is an achievement for a speaker/researcher in India. This is an achievement for not only myself but SARA, NASA, my friends William & Melinda Lord, Dr. Victor, Dr. Jim Thieman, my brilliant friends of the Radio JOVE group from all over the world because without their help this would not be possible. The Jovian Io-C event of December 1 2009 was observed by Radio JOVE participants John Avellone (Central Virginia), a student he mentors at Thomas Jefferson High School for Science and Technology (Northern Virginia), and Wesley Greenman (Northern Florida). 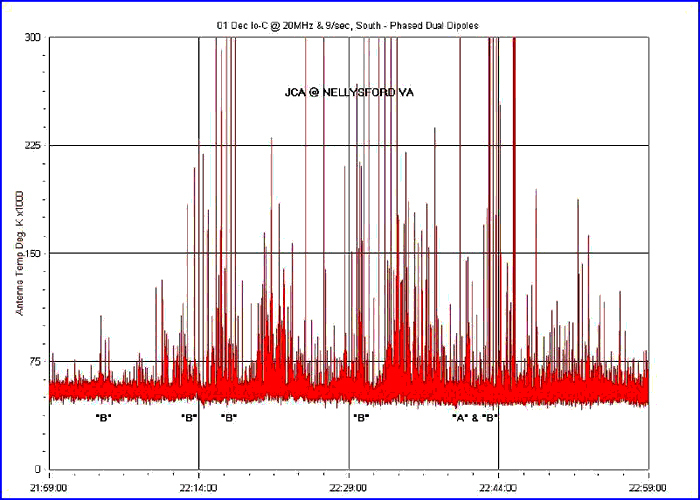 Sky Pipe chart of the event, recorded by John Avellone at 20.1 MHz. Some interference, "sweepers", etc., are present, but the chart also shows good Io-C activity. Io-C bursts recorded by Wesley Greenman, with a spectrograph provided by the University of Florida Department of Astronomy, and a Radio JOVE phased double dipole antenna. Note the prominent Faraday rotation lanes (bursts 1 and 2). The coordinate axis units are hours and minutes of Universal Time, and frequency in MHz. We analyzed the STEREO Observatories WAVES instrument Daily Summary Spectrum for December 1 2009, and noted the Io-C event, recorded in the 3 to 16 MHz band. Io-C event (indicated with a box) recorded by the STEREO/WAVES instrument. Note the three type III Solar bursts (not observed by Radio JOVE), just before the Jovian event. The differences in timing and morphology between the STEREO/WAVES A and B events are probably caused by variations in the Jovian radiated beam, delay due to Jovian rotation, and the finite speed of light. The STEREO Ahead or "A" spacecraft spectrum (upper) is inverted to compare to the STEREO Behind or "B" spacecraft (lower). The upper frequency limit of both is 16 MHz. See also the full STEREO/WAVES Daily Spectrogram Plot. We have found that the STEREO/WAVES data increases our knowledge of Jovian and Solar radio emission, by providing information gathered at frequencies and locations very different from those traditionally collected in the Radio JOVE Project. 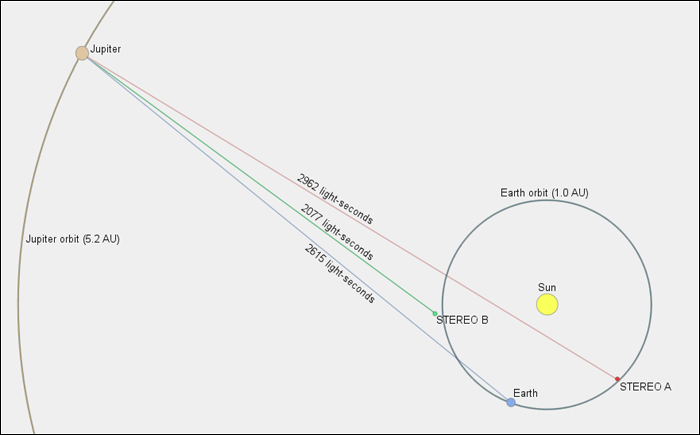 View of the Sun, Earth, STEREO A, STEREO B, and Jupiter, from a vantage point 12 AU above the plane of the ecliptic. Distances and locations are shown for December 1 2009. Sizes of the bodies are grossly exaggerated for clarity. We express our appreciation to the STEREO/WAVES instrument Team. Jim Thieman and Leonard Garcia of the Radio JOVE project were interviewed by Kenneth Silberman of NASA for a podcast describing how the blind or visually impaired can participate in Radio JOVE. Posted on February 3, 2010 at http://www.blindcooltech.com/, the website provides information on technology applications for people who are blind or visually impaired. Jim Sky of Radio Sky Publishing has developed a set of software designed to be accessible to those with visual impairments. These software are available for free download from the Radio-Sky Sonification Tools page. The 2010 Jupiter observing season is under way. The season has no official beginning, but the generally accepted begin data is May 21, 2010. Why? Well, as Earth and Jupiter orbit the Sun, Jupiter will move behind the Sun about every 13 months, called a conjunction. This occurred on Feb. 28, 2010. Thus the conditions for observing Jupiter are poor for about two months on each side of this date. The 2010 Jupiter opposition date is September 21 and that is the best date to observe Jupiter because it is ‘up all night’. The Jupiter observing season will run from May 21, 2010 through January 21, 2011. However, as many of you know, we have talented observers who are detecting Jupiter emissions during the daytime and even closer to the conjunction date. Keep up the good work and let’s hope for an active Jupiter radio ‘season’. For those who are more interested in our nearest star, we hope that the Sun will get more active this year. I wish upon all of you interference-free skies! Bill Lord of SARA discusses radio astronomy with father and son radio enthusiasts. From May 14 to May 16 this spring, a representative from the Radio JOVE Project fielded questions and encouraged participation at the world's largest hamfest in Dayton Ohio. Hundreds of people stopped by our booth which was manned by Jim Sky representing Radio JOVE, Paul Schou representing the INSPIRE Project and Stephen Biggs, Bill and Melinda Lord representing the Society of Amateur Radio Astronomers (SARA). 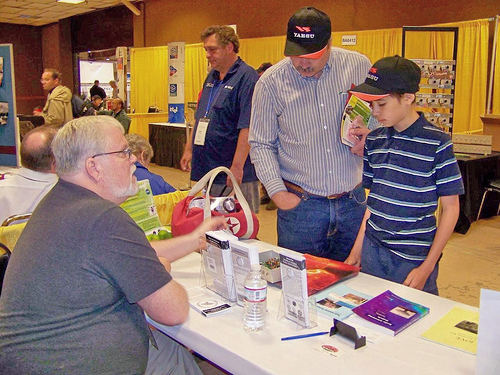 We handed out over 2200 brochures and sold four Radio JOVE kits (all that we had).The American Radio Relay League blog cited our booth as Friday's “Dayton Discovery”. Make magazine dropped by as did an editor from CQ magazine and folks from the Radio Society of Great Britain publications. We think it was a grand success. Using a calibrated noise source like the RF2080 and the Calibration Wizard in Radio-Skypipe 2 observers can establish the vertical scale of SkyPipe to measure antenna temperature referenced to the antenna terminals. Antenna temperature is a way of expressing the power captured by the antenna. Power and temperature are related by P=kTB, where P is power, k is Boltzmann’s constant, T is temperature, and B is the receiver bandwidth. For a given temperature, the wider the receiver bandwidth the higher will be the observed power. Antenna temperature is a measurement taken on the “observer side” of the antenna structure. If we are interested in the amount of power in the incident wave striking the antenna then we talk about flux density. This is the true measure of signal strength from a cosmic source. The units of flux density are a little daunting at first glance – they are watts per square meter per unit of bandwidth. Imagine an electromagnetic wavefront – and consider just 1 square meter of that wavefront. Now measure the power in that 1 square meter with your “receiver” using a bandwidth of 1 Hertz. What you measure is flux density – the unit of flux density is the Jansky (Jy). Of course if you collected power from more than 1 square meter and used a receiver with a bandwidth greater than 1 Hertz, then you would collect more energy. Think of it like a bucket in a rain storm – the bigger the throat of the bucket the more water you collect. Your antenna is a bucket for electromagnetic waves. The bigger the aperture of the antenna the more energy it extracts from the incident wavefront. The antenna actually acts like a passive amplifier. An antenna with a bigger aperture has more gain than a smaller one. Note that the effective area speaks to the area of the wavefront intercepted by the antenna and this may be different than the physical area of the antenna. So our antenna stands between our measurement of antenna temperature and the flux density of the incident wave. If we know the effective area of our antenna in terms of square meters of capture area, and we know the bandwidth of our receiver then we can make an antenna temperature measurement (at the observer side of the antenna) and convert it into flux density on the “space” side of our antenna. A big antenna with lots of aperture and a receiver with a wide bandwidth will capture more energy but when we express it in terms of flux density we must normalize our measurement to 1 square meter and 1 Hertz of bandwidth. Having done this we have a standard method of expressing how strong a cosmic signal is when it reaches our antenna. From P=kTB we have (1.38x10-23 Joules/Kelvin)x(5x105 Kelvin)x(7x103 Hz) = 4.8 x 10-14 watts. This is the power collected in the 7 kHz bandwidth of the receiver. To find the power in a 1 Hertz bandwidth we divide by the receiver bandwidth obtaining 6.9x10-18 watts per hertz. This power was collected by our antenna intercepting 150 square meters of the wavefront – but we are interested in the power in a single square meter – so we must divide by our antenna aperture obtaining 4.6 x 10-20 watts/square meter/hertz. The final step is to express this number in Jy. By definition 1 Jy equals 1x10-26 watts per square meter per hertz. So our final calculation of (4.6x10-20)/(1x10-26) yields the flux density of our burst which is 4.6 million Jy. By the way – this is a huge flux density. Radio astronomers using big dishes in the microwave region frequently detect sources with flux densities less than a hundredth of a Jansky. Radio JOVE is teaming up with the Goldstone Apple Valley Radio Telescope (GAVRT) program (http://www.lewiscenter.org/gavrt/) for teacher education workshops, in part, to help with Juno Mission education and public outreach. 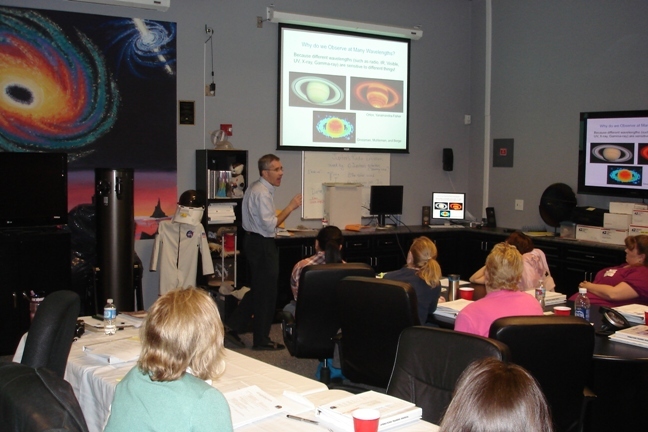 The week of March 8, 2010 was spent teaching 14 educators how to use the GAVRT and Radio JOVE telescopes. They will communicate this knowledge with their students in the classroom.Teachers who complete the workshop can sign up to use the 34-m GAVRT radio telescope in their classrooms. Figures 1a & 1b shows pictures from the GAVRT part of the workshop. Figure 1b. 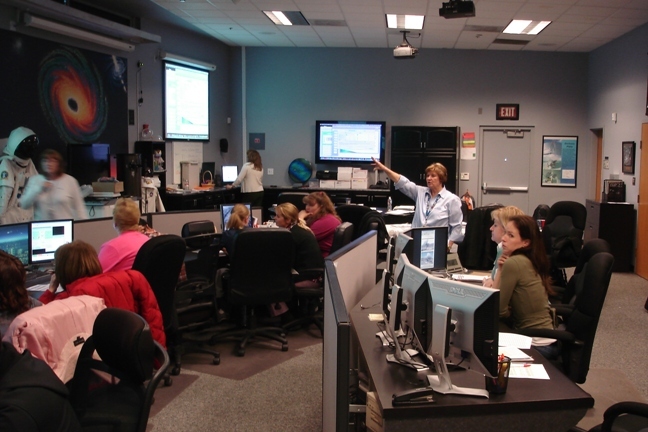 Pat Creeder conducts a GAVRT antenna simulation [LCER, 2010]. Yes, the kids actually take remote control of the million dollar telescope (Figures 2a & 2b) and move it to their target which can be Jupiter, Uranus, the Moon, Mars, or quasars. They take data to help NASA scientists study the variable cloud temperatures of Jupiter or Uranus, or study the variability of quasars. The GAVRT telescope was even used to help calibrate the Cassini spacecraft on its way to Saturn, and students helped NASA with their data during the LCROSS mission to the Moon. Figure 2b. 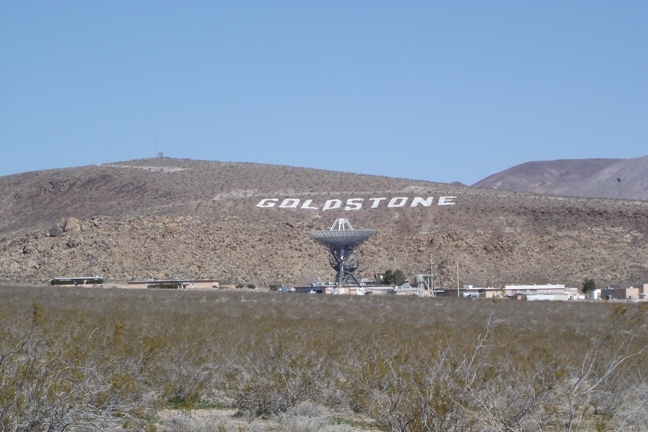 The DSS-12 antenna, one of many at the Goldstone complex in California [LCER, 2010]. While Radio JOVE is not million-dollar equipment, it provides an excellent partner with the GAVRT program because teachers and students can use Radio JOVE to do hands-on radio astronomy in their schools (Figures 3a & 3b). We feel that Radio JOVE and GAVRT can share resources and teacher and student participants to help both programs grow and improve. Figure 3a. 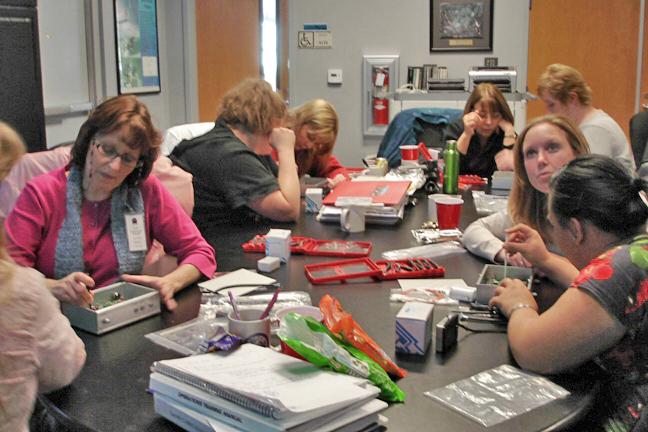 Teachers tune up the JOVE receiver [LCER, 2010]. Figure 3b. 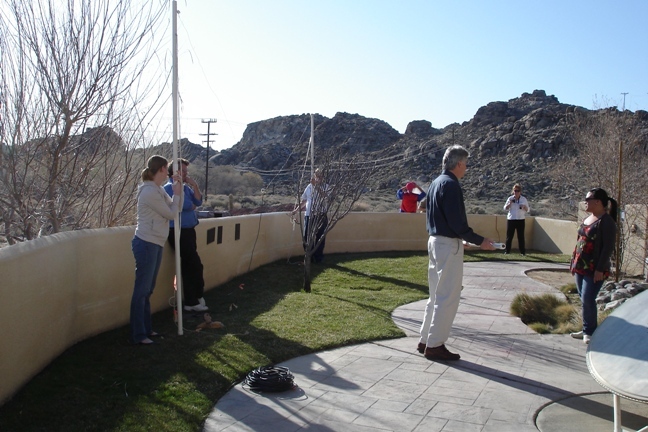 Dr. Chuck Higgins shows how to set up a Radio JOVE antenna [LCER, 2010]. Teacher workshops take place at the Lewis Center for Educational Research (LCER) and are open to all K-14 educators, as well as Informal educators. The workshops are offered four times per year, March, June, July, and October. The workshops cost $745 and teachers come away with a whole range of curriculum activities and classroom support materials, as well as the ability to use the GAVRT and Radio Jove equipment in their classes. Teachers also get ongoing support for their classes and schools so they can use the materials each school year. We are planning to host workshops in Tennessee and Maryland in the coming years. We are also gearing up for the Juno mission to Jupiter, scheduled for launch in August, 2011 (http://www.nasa.gov/mission_pages/juno/main/index.html). Through Juno programs, both GAVRT and Radio Jove will help disseminate NASA science and information about Jupiter, the Juno spacecraft and mission, and about NASA education opportunities. All these efforts are to increase math and science education in K-12 schools and create citizen scientists. If you are an educator or know an educator who might be interested in using GAVRT and Radio Jove in their classrooms, please contact any member of the Radio Jove team. We.ll be glad to put you in touch with the right people to attend an upcoming workshop.